Resplendent in the red cab scheme GMD1 1009 sits waiting for work at the Regina yard. In the previous photo, old 1045 ran long end forward but I think these were rebuilt for short end running. 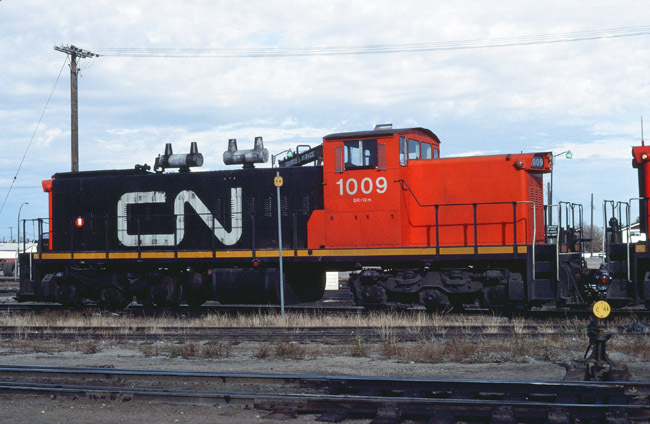 Thus the red nose as per the rest of the fleet although my pictures from Moose Jaw at http://wvrr.ca/prototype/photo_28.htm might suggest otherwise. Someone can correct me on that. I’m interested in the stuff on the ground. No buildings. No servicing here. Just tracks, a short switch stand, a utility pole and some tallish dry grass. How to build a great little yard in 30 minutes. In reality, the classic little roundhouse is on the right; the turntable is in behind and the hoist is just peeking over the cab. Try as I might I can’t find a single photo in my collection of 1012. I have this one and 1010 and others. I reserved 1012 from Rapido but I think they made up that number. Can’t even find it on line. Help? Anyway, it will sure look great running on the KVR down at our club layout. Yes, we do keep pretty close to the KVR motive power and locations for the public but on operating nights we can drive what we want.